In the past two days news stories in England’s Guardian newspaper and on the CNN.com website point to a disturbing trend: the decline of history education at the K-12 level. According to the CNN story, a disturbing percentage of Oklahoma school children cannot identify the first American president. The statistics cited suggest that only 23% of students can identify George Washington. Only 10% of students know the number of Supreme Court justices. A mere 14% correctly identify the author of the Declaration of Independence and a measly 11% know that U.S. senators are elected for a six-year term. As a history professor, this disturbs me and my concern goes far beyond the nationalist bluster of CNN’s commentator who is evidently very worried that others are “smoking us” in the classroom. History imparts a range of exceptionally important skills. It teaches students to do research, to make connections, to read critically, to assimilate and make sense of knowledge, while at the same time offering them context, allowing them to find themselves in time. All of this matters tremendously and we collectively loose out if history education is lost. But there is another question that deserves our consideration: the implications of declining history education for our sense of national identity. Last spring I was interviewed by Josh Levin of Slate magazine for a piece that he was doing on the collapse of the United States entitled “How is America Going to End?” Levin was struck by a growing number of separatist groups in the South, in New England, and beyond. His question was also influenced by the work of a Russian political scientist named Igor Panarin who predicts that the United States will break into six new countries during the summer of 2010.
that "loud voices" like Perry's bolster the country's strength. The fact that we can debate our country's legitimacy is a sign of national health. For the United States to fall to pieces, Zuelow says, it'll take more than a demagogue on a PA. Americans will have to come to believe they're no longer Americans. … There are regional and ideological differences in the modern United States: People in the Deep South and the Pacific Northwest eat different foods, have different accents, and (generalizing broadly) have different lifestyles and values. But as compared with a place like the USSR, a constructed nation with immense regional diversity, the United States is bound together tightly by its shared origins, a common language and culture, and a widely held belief in the country's mythologies (American exceptionalism, self-reliance, and social mobility). In times of perceived danger, Americans pull together. After 9/11, Zuelow says, "I don't care where you were in the country, the response was We've been attacked. … It wasn't, We eat grits and We eat salmon." While I might point out that the United States are every bit as constructed as the USSR was (all nations are), I nevertheless stand by my statement. But here’s the rub. For people to collectively imagine that they are part of a nation, they must also feel that they have common culture, common language, and, perhaps most importantly, common history. Modern historical scholarship is rooted in a nineteenth century nationalist impulse and much of K-12 education is about teaching kids to be part of their nation. We present history to schoolchildren precisely because it teaches them to be citizens. It helps them to imagine themselves as part of a collective, as having interests in common. If history education declines, what then happens to students’ sense of national belonging? Indeed, if the only education they receive about who they are is from media coverage in which one group maligns the other and vice-versa, what message do they take away? History education provides a vital context for such debates. It teaches that while we may disagree, we are also connected. What happens if the “connected” part disappears? Let me close by saying simply this: if history education is lost in primary and secondary schools, I am not certain that I can stand behind my quote in Slate. If history education goes by the wayside, grits and salmon might take on more political significance than any food has a right to shoulder. 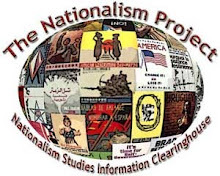 Welcome to The Nationalism Project Blog!